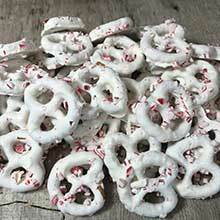 Pretzels covered in a sweet and creamy yogurt coating, then topped with peppermint candy pieces. This seasonal item has a sweet and salty crunch. Price is per pound, not including shipping.